← When The Good Shot Turns Out Not-so-good! A good quality, medium priced, general purpose tripod. Hahnel Triad 30 Lite Professional Aluminium Alloy 4-Section Tripod with 360º Quick Release Ball Head and Free Carrying Case. The tripod has a good ball head to mount your camera, independent leg movement and a central column giving extra height. The greyed section shows the column reversed to hang the camera for ground level shots. These features are great value at this price. The tripod is one of the most import items in the photographers kit. Using something to steady your camera while in use is one of the best ways to ensure your photographs are sharp. Professional photographers use tripods a great deal. The highest quality shots come from the longest exposures. Short exposures tend to have high noise associated with them. On the other hand long exposures are difficult or impossible to hand-hold. So the tripod provides for the platform for the camera to be steady. 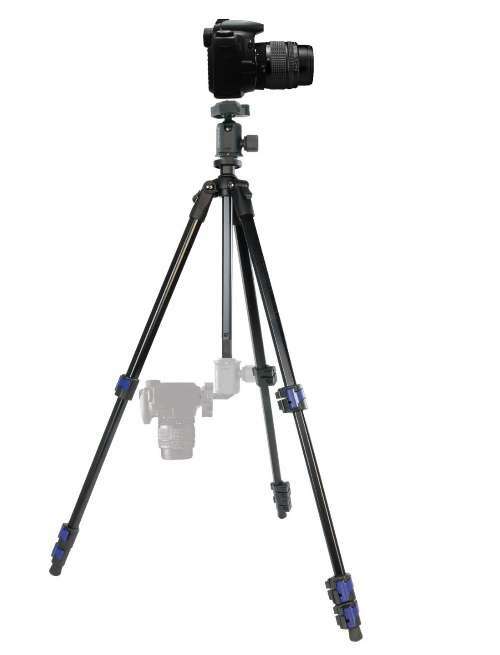 Tripods come in a huge variety of different designs and purposes. In essence they are all the same in functional terms. It is very important to make sure your camera is steady and mounted in a motionless position while taking the picture. The tripod will enable that if it is the right design for the purpose. They are therefore designed for specific environments. Some are better suited to studio work, others to landscapes, some tripods are great for packing into your suitcase and are light for travel. Some small models are designed for use on the table-top for still life work and other studies. If you are just starting out in digital photography a tripod is an important requirement that is often forgotten. Until you know your photographic interests clearly it is advisable to buy a general purpose tripod to ensure that you are able to try out a wide variety of different photographic situations. Getting experience with a mid-priced one is the best way to find out what type you really need. Then later, if your photographic interests become more specialized you can find a tripod to cater for the special requirements. There are a large number of tripod manufacturers and prices differ widely. However, like any piece of technical equipment, the purchase of the appropriate model is likely to help your photography. It is an important investment and, if well looked after, your tripod will last you for years. This entry was posted in Background Info., Definition, Equipment and tagged Camera, exposure, How it works, How to Shoot, Tripod, Vocabulary. Bookmark the permalink.